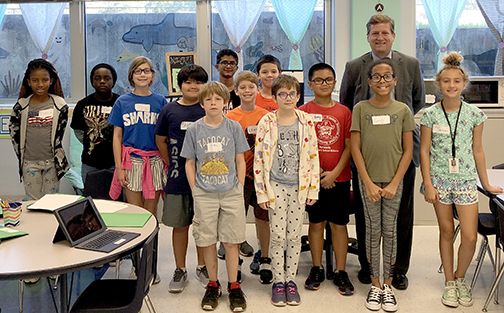 Fifth-graders in ALPHA, Pattonville's elementary gifted education program, had the opportunity to learn about government from a circuit court judge. John Newsham, an associate circuit court judge in St. Louis County, visited students in ALPHA teacher Amanda Clark's "We The People" government and law class. Students have been studying the basic concepts of government and the Bill of Rights. The judge's visit was part of their learning. Several students shared their thoughts about the visit and what they learned. "Today our class met Judge Newsham," said Emily Erickson-Karanja. "He is a judge that works on criminal cases. From him I learned that you have to be a lawyer before you become a judge. You go to law school for three years and college for four years. He told us that whatever path we take in life, always be fair." Tabitha Derry-Coulter said, "I also learned that the amendment of the Constitution that (Newsham) feels is the most important is Amendment 6, the right to a trial by jury and an advocate to speak for you in court. Finally, I learned that when Judge Newsham was a municipal judge, he studied law part time, but now as a circuit judge, he doesn't study law anymore. I feel like this was a fun experience for me." "From him we learned that there has been all sorts of crazy trials," said Spencer Mitchell. "My favorite was the trial that went on for weeks. A thing I still want to learn is what was the weirdest trial he ever took. Judge Newsham taught me a lot about court, and I can't wait to learn more." Zoe Click said, "I still need to learn about laws and I learned that it can be stressful to be a judge but also fun. It sounded difficult to represent the people that were not guilty but had no proof that would work for helping them with the case. Judge Newsham said that it was fun to be a judge and a lawyer and I should be a lawyer if I want to be. I am going to tell my mom and dad that I know what I want to be when I grow up." "This was an experience that I will never forget," Erickson-Karanja said. Judge John Newsham is shown with fifth-graders in Pattonville's elementary gifted education program.